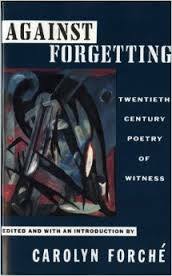 In the introduction to her anthology, “Against Forgetting,” Carolyn Forché writes that a poem of witness is both “an event and the trace of an event” (33), which suggests to me that in addition to acknowledging and normalizing a traumatic event, a poem is, in and of itself, an event. Forché observes that that while the former is rarely entered into voluntarily, the latter most certainly is. Therefore, responding to traumatic events, over which the poet has little or no control, through a voluntary and overt act, such as writing a poem, accomplishes two things: acknowledges the event (instead of denying it) and initiates a new event, one that both normalizes the initial event and allows the poet to exert some control over the event’s effects. Siegfried Sassoon’s “Repression of War Experience,” illustrates well Forché’s idea of the poem as an event by translating the very personal space of a soldier’s mental landscape into recognizable images that bring this specific war event into the realm of the social. The speaker’s actions, “Now light the candles” (1) and “light your pipe” (10), are as common on the battle front as they are to a typical living room. Likewise, familiar images like books “Standing so quiet and patient on their shelves” (18) or the garden that “waits for something that delays” (28) harken the cozy atmosphere of home, an image any reader can easily visualize (made all the more poignant by the speaker’s distance from home). Sassoon’s ability to tap into the universal experience of trying to avoid certain thinking patterns is also effectively rendered in lines like “it’s bad to think of war, / When thoughts you’ve gagged all day come back to scare you;” (5-4). The reader, like the speaker (and the moth that inhabits this poem) can all easily “blunder in / And scorch their wings” (2-3) on those gagging thoughts and find themselves “driven out to jabber among the trees” (8). The universality of these specifics can be translated to other traumatic events and could be revised to reflect the experience of a mother with postpartum depression, or a child who is abused by a parent or school-yard bully. But the poem at hand is about neither of these things. We know this from poem’s title as well as such lines as “You’d never think there was a bloody war on!” (34) and “Those whispering guns” (38) (a particularly striking juxtaposition of images). “Repression of War Experience” is a response to a specific event experienced by the poet and is in turn a specific event that is the poet’s experience. The universal language of witness allows us to appreciate another’s experience without diminishing an its distinctness and we understand that this poem is “a specific kind of event, a specific kind of trauma” (Forché 33), separate from our own. exemplifies Forché’s assertion that “[e]xtremity […] demands new forms or alters older modes of poetic thought [and] also breaks forms and creates forms from these breaks” (42). Because we are not the people who learned last time. The light at the end of the tunnel is the train. While there is much more to discover and learn about the poetry of extremity and the processes behind writing such poetry, Forché’s continues to be the conversation to which poets and critics must refer to and cite for years to come, just as these are the poems that best exemplify the poetry of extremity for the twentieth century. This entry was posted in Writing, Revising, Blogging and tagged "Against Fogetting", Carolyn Forche', Poetry Explications, Poetry of Witness, Poetry Response, What is a poem of witness?, Who is Carolyn Forche? on September 17, 2014 by Lisa M. Hase-Jackson.